Buckle Banter: Blueberries Rock Our Summer! Steve: I have far too many food obsessions. I indulge most of them far too often as evidenced by the strain my belly puts on the waistband of my jeans. You should never put your hand near the cheese plate, for instance, because you might lose a finger. I can’t get enough cheese – it’s an obsession – and when it’s in front of me, I want it all. Chips? Forget about it. It takes an act of god to keep us from eating an entire bag in a single sitting. Jason: In fact, we rarely buy chips anymore for that reason, although occasionally we splurge, and since chip bags are all plastic it just seems a waste. If only some company would make a bag that is compostable, or that could be recycled, we would eat them daily. Oh, and Steve loves to exaggerate about his waistband. Steve: While I have my regular food obsessions, some of the craziest are seasonal, triggered by the strong visual cues of farmers market tables overflowing with the season’s bounty. At the moment, blueberries are everywhere teasing and taunting me with their gorgeous powdery navy blue skins. I love them … a lot! We eat them raw in cereal and atop pancakes. We cook them into the pancakes when the urge strikes. Jason just made some blueberry jam that is out of this world. We’ll be eating it on everything this summer. Jason: A few weeks ago at the Sunday Farmer’s market, Steve wanted more blueberries. We already had some sitting on the counter, uneaten, but Steve wanted more. I was all for buying them if he had a plan, but he didn’t. He wanted me to make a blueberry buckle but it had to be put on hold until I purchased a springform pan– he didn’t want to hear that. He pouted like a little boy being told “No, you can’t have that candy bar.” To compromise, I told him I would go pick up the springform pan and visit the Wednesday Farmer’s market in the Castro to pick up the blueberries for him. Steve isn’t one for delaying gratification. When he wants something he wants it now! 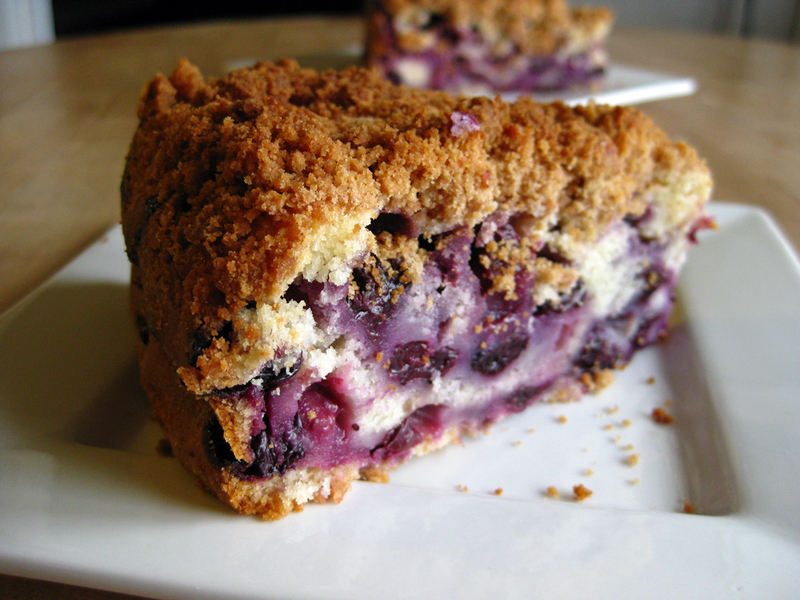 Steve: I’ve been driving Jason crazy whining for one of my all-time favorite blueberry treats – blueberry buckle. We discovered this delicious cake while flipping through the July/August 2000 issue of Martha Stewart Living magazine a few years back. My first taste of blueberry buckle rocked me to my core and set off an addiction that remains unabated. Since the beginning of this year’s blueberry season, I have been begging for buckle and Jason finally gave in this weekend. Yummy cake loaded with juicy berries and covered in a buttery crumb topping drives me crazy! The leftovers drive me to distraction which means I can’t rest until the last crumb has been licked from the plate. Jason: However, Steve was all for tossing the last piece because he thought it wasn’t good any longer. Not being one to waste anything, but also knowing the shelf life of cookies and cakes, I told Steve that if he did not eat the buckle I would never make another one for him again. I also told him that if he gets sick I would take full responsibility. Alas, both of us are healthy and all is good. Nothing went to waste and we enjoyed the very last crumb–at least I did. Steve: It might be wrong for me to tempt others to indulge in one of my crazy addictions, but I’m an enabler. As they say, misery loves company! Heat oven to 350. Butter and flour springform baking pan, and set aside. In the bowl of an electric mixer fitted with the paddle attachment, cream butter and sugar on medium speed until light and fluffy, about 3 minutes. Reduce mixer speed to low, and add egg and vanilla. When combined, alternate adding reserved flour mixture and milk to mixer, beginning and ending with flour mixture. Remove from mixer; gently fold in berries. Pour batter into prepared pan; sprinkle topping generously over cake. Bake 60 to 70 minutes or until cake tester comes out clean. Remove cake from oven; leave in pan 10 minutes on a cooling rack. Remove from pan; let cool 15 minutes before serving. In a medium bowl, mix dry ingredients together; cut in the butter using a pastry blender or fork until fine crumbs form. Using hands, squeeze together most of the mixture to form large clumps. Store, refrigerated, in an airtight container, or sprinkle directly onto cake. This looks/sounds to die for! O.M.G. that looks good. Until recently, I’ve been eating so many cherries I was afraid I might turn into one. I kept thinking I was missing something in my diet – some antioxidant or something – that was making me eat them compulsively. (Good excuse, right?) Fortunately the blueberries are coming in to take their place, but summer fruit is so fleeting. Wah. Aside: I can’t believe blueberries hang around long enough in your kitchen to be made into jam. I bring them in and as soon as I blink I’m scarfing the last one! Most I can express is, I don’t know what to rlaley say! Except needless to say, for the amazing tips which have been shared within this blog. I will think of a zillion fun approaches to read the articles or blog posts on this site. I do think I will eventually take a step with your tips on areas I could not have been able to manage alone. You’re so clever to let me be one of those to profit from your handy information. Please see how considerably I appreciate it.